When light rail service started at the end of 2008, residents of the Phoenix Metro Area were introduced not only to passengers trains, but also to vertical bike storage. Four years later, hanging one’s ride on the train has become a ritual for commuters who combine bicycling and public transit. 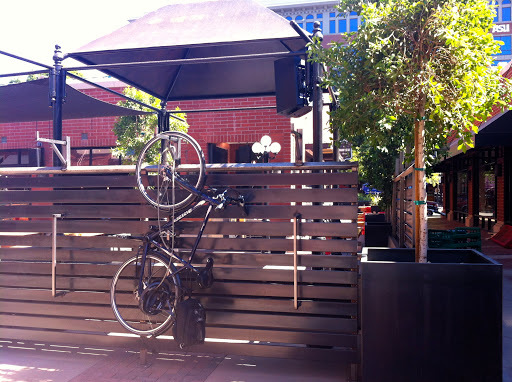 Maybe it’s just coincidence, but it’s hard not to notice the similar design of the vertical bike storage that rings the patio at Tempe’s new Handlebar and Grill, a bike-themed pub which just happens to be just four blocks from the Mill Avenue / Third Street light rail station. 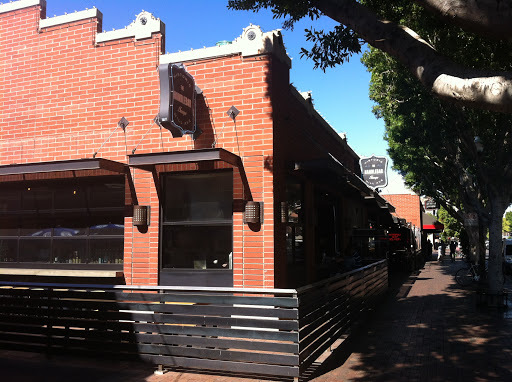 Handlebar incorporates a lot of influences — not only the culture that has grown up around light rail and bicycles in Phoenix, but also the European tradition of beer gardens, outdoor spaces for drinking, eating, and socializing. There’s an attractive indoor space with a big bar, long high-top tables, and a few booths with a more private feel. Outside, there’s even more square footage. Big garages doors open up to a large open air dining area in the interior of the Centerpoint development. It’s a great space marred only by the presence of ashtrays at the tables. Smoking is likely to be an issue only at night, so the outside tables are usually good for lunch, and the interior is always smoke free. No matter where you sit, take a moment to look behind the bar. There’s an impressive 24 tap handles there, and an equal number of bottled beers. The emphasis is on craft brews. 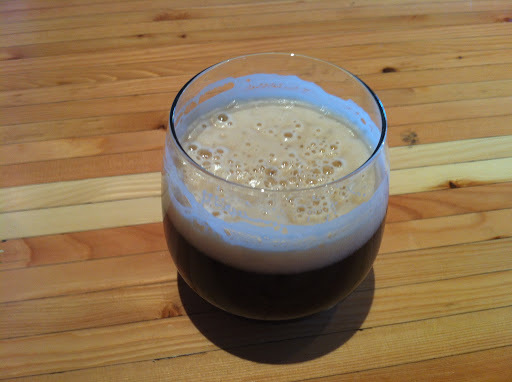 That means some constants like local favorites Kilt Lifter and Devil’s Ale, but it also includes a rotating selection with choices such as Duchesse de Bourgogne, a Belgian ale redolent of sour cherries, and Bell’s Oarsman, a tart wheat ale. 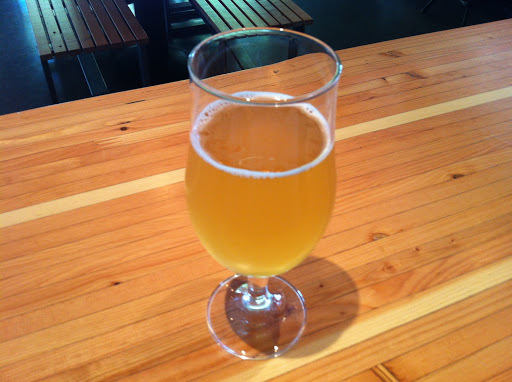 The draft beers are generally served in 10 or 12-ounce pours, not pints, so enjoy the opportunity to sample two or three different brews in one sitting. There’s also a small selection of wines by the glass and beer-based cocktails. Although the beverage menu is expansive, the food choices are constrained to a selection of sausages, burgers, fries, and pretzels. Beer gardens aren’t known for extensive menus, but Handlebar is limited even more because plans for an outdoor kitchen fell through and the pub now uses a small room inside for food preparation. Despite the tiny space available for cooking, Handlebar makes the most of its simple menu through good ingredient quality paired with varied toppings and condiments. As one would expect in a beer garden, brats are a big deal here. There are a few varieties offered, all from local provider Schreiner’s Sausage. The fresh brat is the most straightforward, but the traditional Polish has a richer flavor. Surprisingly, the “Hot Italian” is rather mild, as is the Southwest Smoked Turkey. The chicken-and-apple brat is a lighter sausage with a bit of cinnamon. 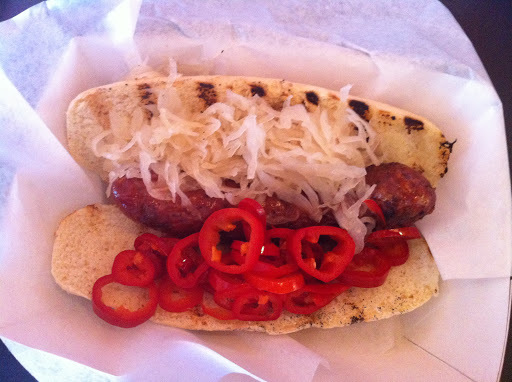 All brats come in a toasted bun with a choice of any two of four toppings: pickled peppers, a mild sauerkraut, sweet peppers, and grilled white onions. 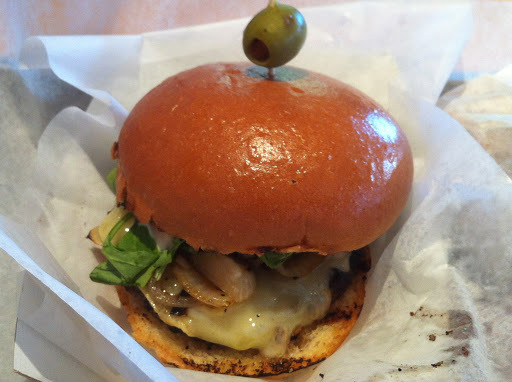 Aside from the sausages, the only entree choice is a hamburger, offered either in a classic version that resembles a standard cheeseburger, or a “Handlebar Burger” with arugula, blue cheese, and caramelized onions. The grass-fed beef makes for a burger that is lean yet flavorful. Currently, there’s no vegetarian entree, but the kitchen has been known to improvise a grilled cheese on request. Whether the choice is burger or brat, the fries should be considered a mandatory accompaniment. These are freshly cooked strips of potato with their skin still on and all their natural texture and flavor intact. They’re great on their own, but each order comes with a choice of one of five dipping sauces. Thai ketchup adds a bit of a lime flavor to the traditional condiment, Spicy BBQ more than lives up to its name, and black pepper ranch has a nice bite with each dip. 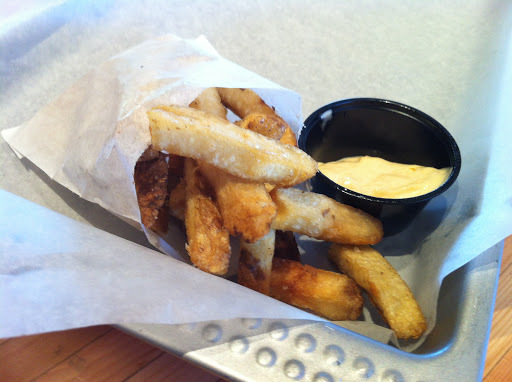 The blue cheese bacon and sundried tomato basil aioli are more subtle condiments. After brats, burgers, beer, and fries, there’s only one part of the menu left to explore: the pretzels. These are described as Belgian-style. They’re soft, flaky, and elastic almost to the point or resembling croissants. 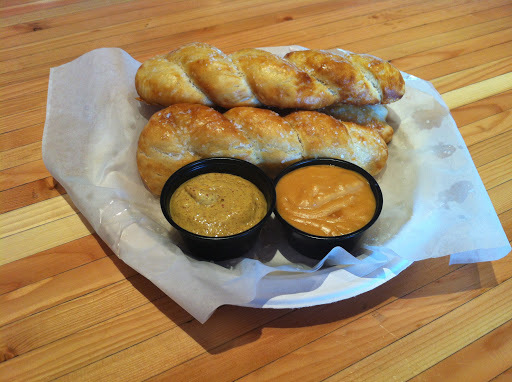 Served warm and three to an order, these pretzels come with coarse mustard and melted sharp cheese. They’re a good choice for a table to share during happy hour. There’s no dessert on the menu, so stroll down the street to one of Mill Avenue’s innumerable ice cream, frozen yogurt, or paleta shops if something sweet is needed to end the meal. Handlebar may not be a unique concept in terms of its menu, which serves reliably good beer garden standbys without a lot of room for innovation, but it is a blend of influences and design elements that is uncommon and refreshing in the Phoenix Metro Area. Whether you walk or ride a bike the short distance from the rail station, Handlebar is easy to reach, even if the vertical bike racks outside the restaurant, just like those on the trains, can require some riders to stand on their tiptoes. It’s all worth it to burn the calories from those beers and brats.